Brightest Day #0 came out this past Wednesday and was one of the more anticipated comics to be published in recent months. 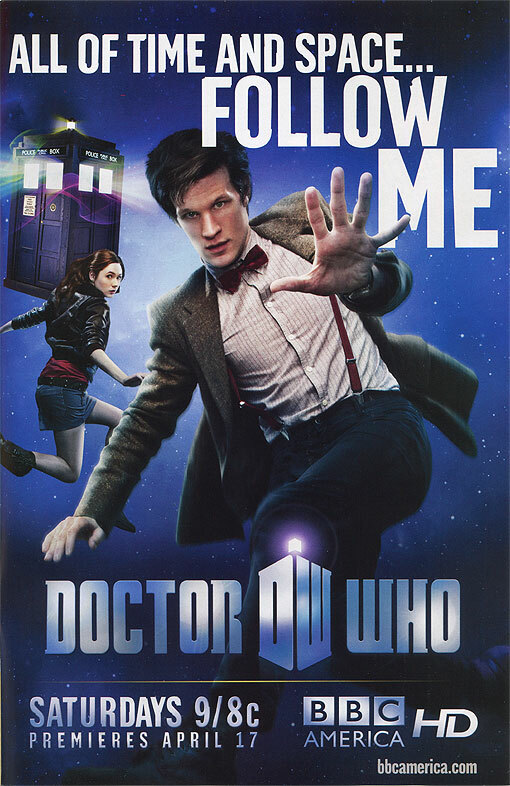 While reading the issue, I was floored to find a Doctor Who advertisement on the inside back cover. Wow! There was a larger, like 4 page series of ads in Entertainment Weekly. One page had the Sonic Screwdriver, then you turn the page and there was something else, then you turn the page and there was a Dalek and then you turn the page and the ad you have above was there. I thought about giving you the issue but the cover is too good to give up, Chewbacca holding up Princess Leia. So at least I’ve got a little frame of reference for the show. Looking forward to it! I see the sorcerer Steven Moffat is channeling the spirits of Grant Morrison and Russell T Davies. That’s fair. Matt Smith is channeling David Tennant. And Karen Gillan is channeling a cute mop. The TARDIS is channeling Pee Wee’s Playhouse. I wasn’t going to look at any spoilers, but after last night’s disappointing UK Dalek episode with repeat villain The Weeping Angels next week, I want to see if there’ll be any episodes that can raise the bar this season.